TBT: The Lovin' Spoonful, "Summer in the City." It was ninety degrees in the shade yesterday, so this may seem an obvious choice. Maybe too obvious. Still, I like the song. It's worn well. In the photo at left the band are (from bottom to top): John Sebastian, Zal Yanovsky, Joe Butler, and Steve Boone. Yanovsky left the band in 1967 and Sebastian in '68, both to pursue solo careers. Yanovsky died in 2002. The group disbanded in 1969, but in 1991 Boone and Butler, along with Jerry Yester, who had replaced Yanovsky in '67, re-formed the band. 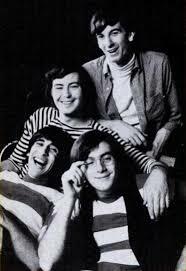 The Lovin' Spoonful continue today with Boone, Butler, Yester, Mike Arturi, and Phil Smith. Note: when I first posted this, I misidentified the order of the band members in the photo, and misspelled "Yanovsky." My friend and rock maven extraordinaire Michael Simmons set me straight, and I've corrected the post accordingly. Steeleye Span at B.B. King's, New York, July 23, 2015. When my wife said Steeleye Span were to appear at B.B. King's I was surprised, thinking the group, an old favorite of mine, had broken up years ago. They did break up in 1978, when lead singer Maddy Prior wanted to pursue a solo career. Nevertheless, Maddy later reconstituted the band, of which she is now the only original member. 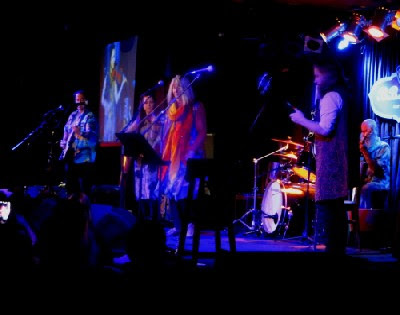 In the photo above the band members are (from left to right): guitarist and vocalist Julian Littman; fiddler and vocalist Jessie May Smart; Maddy Prior; bassist Nils JerusalemP, who recently joined the band in Seattle as a replacement for Maddy's son, Alex Kemp, who, according to Maddy, had some "paperwork problems" entering the U.S.; and drummer Liam Genockey. The band opened with "Blackleg Miner," a song about a nineteenth century coal miners' strike. A "blackleg" was a strikebreaker, or scab. The clip above, made some years ago, shows an earlier lineup of musicians. Maddy carries the vocal by herself. At the performance last week, the other band members joined in harmony. Maddy, who will celebrate her 68th birthday on August 14, has a voice that is every bit as strong and in command of its full range as when she was younger, but the harmony vocals gave this song more of the "oomph" it needs. Their next song came from my favorite of their albums, Commoners Crown. "Long Lankin" is a typical old English ballad, telling of betrayal, child murder, hanging, and burning at the stake. Some of Steeleye Span's songs, lovely as they are to hear, have very dark lyrics. This is because Medieval England, from which place and time these songs originated, was, for many, a place and time where life, to borrow the words of the seventeenth century philosopher Thomas Hobbes, could be "solitary, poor, nasty, brutish, and short." The clip above is audio only; it starts with an image of the album cover, then goes to solid black. Dark indeed. "King Henry" starts darkly: the King finds himself in a haunted house in the company of a horrific female ghoul who, in the words of Julian Littman, who introduced the song and took the lead vocal, forces him to "kill his household pets," which she devours, then to join her in bed. It ends on a bright note, though; he wakes up the following morning to find next to him the loveliest woman he's ever seen. It's good to be the King. The band ended the concert (except for a lovely a cappella encore, the title of which I can't remember) with "Thomas the Rhymer." This song has a theme common to many of its vintage: a man, or sometimes a woman, is captured by an elf or fairy queen or king, goes through some sort of ordeal, and returns changed in some way. In the case of Thomas, it was supposed to be having the gift of prophecy. Another song, "Tam Lin", as done by another great English folk rock group, Fairport Convention, tells a tale of a man saved from the ordeal by the intervention of his lady love. I didn't know what to expect of this concert, and was prepared to be disappointed. I was very pleasantly surprised. Maddy Prior is still in top form, and the new band members performed admirably. Special mention goes to Jessie May Smart, whose fiddle playing was extraordinary, and to Nils JerusalemP, who obviously has learned the band's repertoire quickly and adeptly.